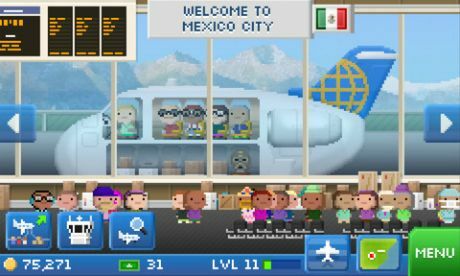 Pocket Planes is the latest game from Tiny Tower developers Nimblebit and overall an amazing game that is proving to be an instant hit already. And I have played this little game for a long time now – probably just like you did – and I want to share some of the strategies I have used in Pocket Planes, alongside tips and tricks in something that will hopefully become a really useful Pocket Planes guide. Please note that due to the complexity of Pocket Planes, these tips & tricks might not be complete or cover all the areas of the game, but I am doing my best to share with you everything that I consider useful and if you have any tips and tricks to share, please feel free to do so in the comment section below. 1. Choosing the Starting region: you probably did this already, but my advice would be to pay little attention to the starting region in Pocket Planes as all the regions are similar and even. So if you think that you’ve picked the wrong starting region for your company, you didn’t! 2. Plan ahead. Your goal is to make the most possible money and careful planning is what you should do: completely loading a plane with jobs for the same destination gives you a 25% income bonus, and that is exactly what you should focus on doing. 3. Avoid sending too many planes at the same destination: you might find out, once you get there, that you don’t have enough jobs for all your planes and this means that you lose money. Try to even out the destinations to make sure that your airplanes will always have something to do. 4. If you are considering buying a new plane but you’re short on the premium currency (Bux), be patient. I found out that it will actually be a lot cheaper if you buy parts for the plane and build it from parts rather than purchasing the whole plane at one time. The only thing you should consider when you do this is that all the parts (body, engine and controls) must match and most likely you won’t find them all in the market at the same time. But the market refreshes ever 10 minutes or so, so if you are really active for a while and keep checking out the market, you will eventually get the three parts and be able to assemble your plane and the final cost will be lower than that of purchasing a brand new plane! 5. Make sure that you have some Class 2 (blue) or Class 3 (red) airports before buying a Class 2 plane! Class 2 planes can’t land in Class 1 (grey) cities, so it would make no sense to invest in one if you don’t have how to use it. 6. Don’t go for airports that are too far away: especially at the start of the game, the starter planes can’t cover too much distance and even though airports that are farther away will generate more income, your profits will be lower. 7. Pay attention to waypoints! If you set too many waypoints, you can’t stop to refill the cargo and you might end up losing money. So when making multiple deliveries, make sure that you can take a new job: many airports that you will land at will offer you jobs for the other airports you’re heading to and eventually you can fill your plane with jobs for the same destination and get the 25% bonus we’ve talked about already. 8. Usually, longer jobs are less profitable than shorter jobs that you can perform faster. However, you should plan ahead and see if you have the time to check back and send your plane going once again or you might end up earning less profits. So always plan ahead and try to anticipate your activity in Pocket Planes! 9. Always keep planes as full as possible – for the 25% bonus or not, one of the most obvious ways to earn more from your planes is by keeping them as full as possible at all times. If you have any other tips and tricks or strategies to help Pocket Planes players, please share them with us by commenting below and helping this article become a true & complete strategy guide for this amazing game!